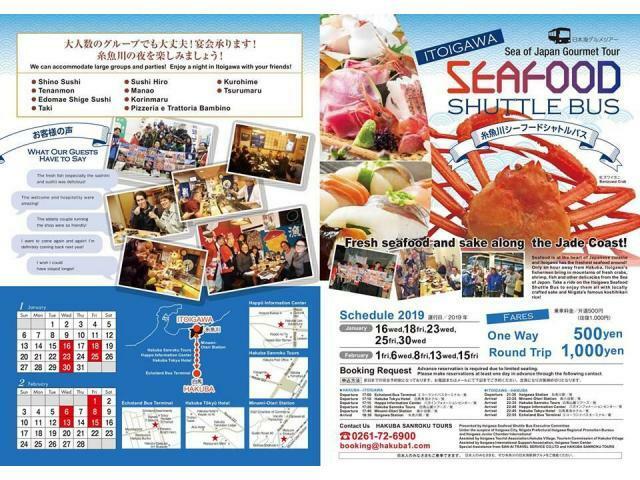 Check out the list of participating restaurants for the 2019 Itoigawa Seafood Shuttle Bus! This year's shuttle bus will start on Wednesday, January 16th and will run every Wednesday and Friday until Friday, February 15! Join us in Itoigawa to enjoy some of the area's best seafood, sake and more! If you're interested in joining, contact us by Facebook or call Hakuba Sanroku Tours at 0261-72-6900 for more information!